Our goal is that you are 100% satisfied with your Boolean Girl Tech Products. We are an early stage company that relies on the word of mouth and support of our customers to grow! We will not stop working with you until you feel completely satisfied with your Boolean Box or other Boolean Girl Tech product. If your Boolean Box or other Boolean Girl product is not working to your satisfaction we request that you work with us to resolve any issues before your return the product. You may contact us through the website or via email at support@booleangirltech.org. If we cannot resolve material and workmanship issues in the product we will replace the product or provide a full refund. If you do not want to keep a Boolean Girl Tech product, you are welcome to return it within 30 days of purchase. We reserve the right to reduce your refund to reflect any reduction in the value of the product(s). You must return the product within 30 days of purchase. We ship for free so there is no refund for shipping costs. If you paid for expedited shipping we will not refund the difference. Notify us via e-mail at Returns@booleangirltech.com and provide the order details: Order number, email address associated with the order, source (e.g. Boolean Girl Tech website, Amazon, Ebay, etc), reason for return. You must return the product(s) to us in original packaging using a tracked mail service. We will send you a return address within 15 days of you emailing us, notifying us of your intent to return. You will be responsible for the cost of returning the product(s) to us. This limited warranty covers defects in materials and workmanship in this product thru a period of 12 months from delivery. Some of the components we sell come with a manufacturer’s guarantee. For details of the applicable terms and conditions, please refer to the manufacturer’s guarantee provided with the products. A manufacturer’s guarantee is in addition to, and does not affect, your legal rights in relation to products that are faulty or not as described. (e) exposure to excess moisture, fire, improper packing and shipping (such claims must be presented to the carrier), lightning, power surges, or other acts of nature. Replace faulty components with the same or a similar components. Replace the entire product with the same or a similar product deemed by Boolean Girl Tech to perform substantially the same function as the original product. Issue a refund of the original purchase price. 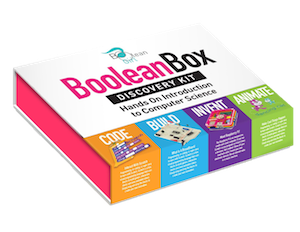 If your Boolean Box or other Boolean Girl product is not working to your satisfaction we request that you work with us to resolve any issues before your return the product. You may contact us through the website or via email at support@booleangirltech.org. If we cannot resolve material and workmanship issues in the product we will replace the product or provide a full refund as described above. THE MAXIMUM LIABILITY OF BOOLEAN GIRL TECH UNDER THIS LIMITED WARRANTY SHALL NOT EXCEED THE ACTUAL PURCHASE PRICE PAID FOR THE PRODUCT. TO THE MAXIMUM EXTENT PERMITTED BY LAW, BOOLEAN GIRL TECH IS NOT RESPONSIBLE FOR DIRECT, SPECIAL, INCIDENTAL OR CONSEQUENTIAL DAMAGES RESULTING FROM ANY BREACH OF WARRANTY OR CONDITION, OR UNDER ANY OTHER LEGAL THEORY. Some countries, districts or states do not allow the exclusion or limitation of relief, special, incidental, consequential or indirect damages, or the limitation of liability to specified amounts, so the above limitations or exclusions may not apply to you. TO THE MAXIMUM EXTENT PERMITTED BY LAW, THIS LIMITED WARRANTY AND THE REMEDIES SET FORTH ABOVE ARE EXCLUSIVE AND IN LIEU OF ALL OTHER WARRANTIES, REMEDIES AND CONDITIONS, WHETHER ORAL OR WRITTEN, EXPRESS OR IMPLIED. TO THE MAXIMUM EXTENT PERMITTED BY LAW, BOOLEAN GIRL TECH SPECIFICALLY DISCLAIMS ANY AND ALL IMPLIED WARRANTIES, INCLUDING, WITHOUT LIMITATION, WARRANTIES OF MERCHANTABILITY AND FITNESS FOR A PARTICULAR PURPOSE. IF BOOLEAN GIRL TECH CANNOT LAWFULLY DISCLAIM OR EXCLUDE IMPLIED WARRANTIES UNDER APPLICABLE LAW, THEN ALL IMPLIED WARRANTIES COVERING THIS PRODUCT, INCLUDING WARRANTIES OF MERCHANTABILITY AND FITNESS FOR A PARTICULAR PURPOSE, SHALL APPLY TO THIS PRODUCT AS PROVIDED UNDER APPICABLE LAW. This limited warranty is void if (i) the product is not distributed by BOOLEAN GIRL TECH or (ii) this product is not purchased from an authorized BOOLEAN GIRL TECH reseller. BOOLEAN GIRL TECH thanks you for purchasing a BOOLEAN GIRL TECH product. We hope it will give you years of satisfaction.